The Pens Hockey Show: Things Could Get a Little Wild! This game could get a little wild at Consol Energy Center as the Pittsburgh Penguins take on the Minnesota Wild. The Penguins come into this game with the fewest losses this season in the National Hockey League (NHL) against Western Conference teams (two). That means they have won seven out of nine contest against the West. Not only that, they have a .778 points percentage versus Western Conference, which is an NHL best. This all points to tonight's game being an interesting game. Now on offense, the Penguins have Brandon Sutter. He has recorded six goals and two assists in his last seven games against the Wild. To add to that, when Sutter scores this teams are a percent 5-0 (CAR, 3-0 and PIT, 2-0). Sidney Crosby and Evgeni Malkin are looking like they are all over the ice during games, as they have figured into every Penguins goal in the last four games. Talk about a two-headed monster. 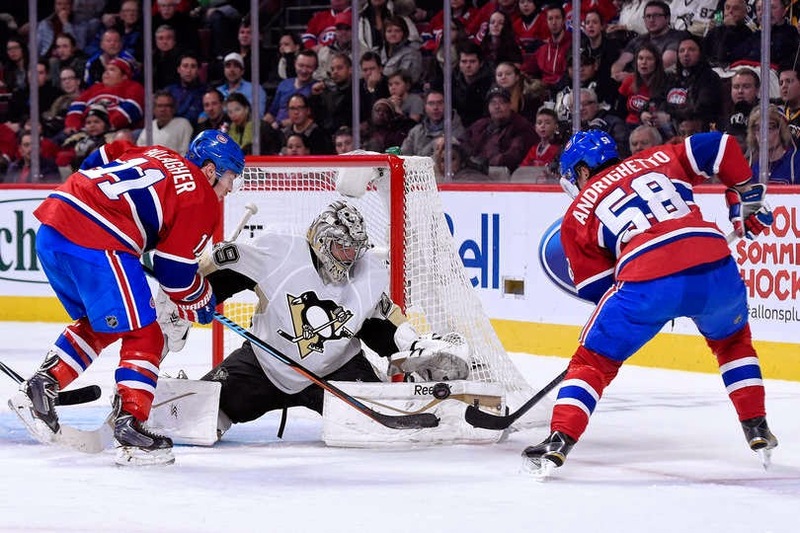 During the Penguins overtime win against the Montreal Canadiens, Saturday night, Crosby scored the game winning goal. It marked his seventh in his career, which put him third in franchise history overtime goals, tied at seven with Malkin. Mario Lemieux is first at 11 and Jaromir Jagr comes in second with nine. On defense, Simon Despres has been putting on a show the last 10 games. He is ranked frist among defensemen in assists at six (since Dec. 20, 2014.). Kris Letang comes in at second, but has only four (two behind Despres). Despres is picking up his game with the Penguins suffering injuries and illnesses on defense, thus showing that he is ready to step up anytime he is called on. Onto the morning skate and the lastest updates. All the Penguins were at the morning skate and worked on the same lineups, as they did in Montreal. Not new updates on those fronts. However, there could be an injury update very soon for the Penguins regarding Olli Maatta. Maatta has been out since December 6, 2014. He ended up re-injuring his surgically repaired shoulder. Just a few days later, Maatta was diagnosed with mumps to add to everything. His doctors were hoping he could rehab the shoulder, but it doesn't seem to be working. It was reported by TribLive.com that Maatta could miss the rest of the season and his doctors are deciding whether or not he needs a second surgery. Mike Johnston commented, "Olli is going through further test. Nothing is definitive yet." Paul Martin was also asked about this development and stated, "We've known what's been going on for a while, and hoping that he could play. Maybe he couldn't. He has to make sure that he's taking care of his body. He's a young kid. I think we'll miss. Hopefully he gets fixed up and back soon." Nothing is for certain yet, but I know I am with every Penguins' fan when I say we hope for the best and that he has a speedy recovery. 0:00- PENS DOMINATE THE WILD WITH A 7-2 WIN! FLEURY HAD TO STEP UP EARLY AND OFTEN, BUT THE PENS TOOK ADVANTAGE OF A WILD MELTDOWN! WAY TO GO PENS! 1:18- A total and complete meltdown by the Wild tonight and the Pens are more then happy to take advantage. 3:21- PERRON SCORES HIS SECOND GOAL OF THE NIGHT!!!!!!! Crosby pressures to get a turnover! Kunitz takes the puck behind the net and outlets to Perron! Perron doesn't miss! 7-2 Pens! 6:03- Fontaine Scores. Fontaine brings the puck into the zone and rips a shot (from the faceoff dot) right past the glove of Fleury. 6-2 Pens! 6:50- The Wild get some pressure in the offensive zone. The Wild crash the net, Fleury makes snow angle save and the post also helps him out! 9:03- The Wild pull Backstrom and put in Curry. 9:04- LETANG SCORES!!!!!! 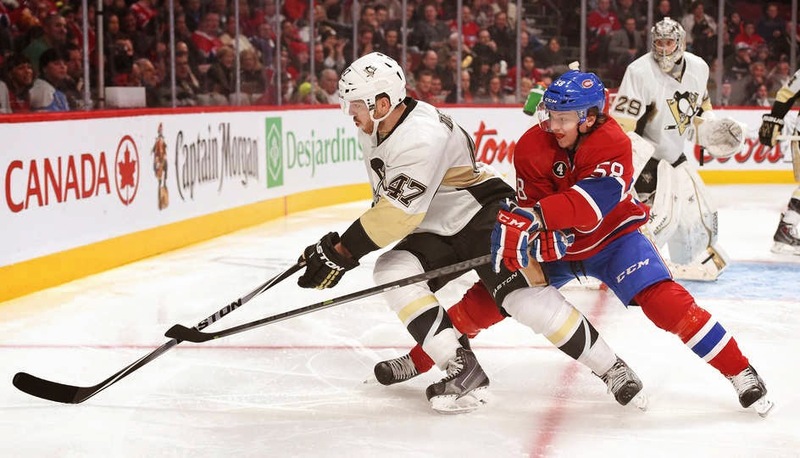 Perron passes over to Letang who drives to the net! He stick handles his way around Backstrom and puts the puck in! 6-1 Pens! 9:52- Ehrhoff is back on the bench. 10:53- MARTIN SCORES!!!!! Martin drives to the front of the net, it goes off Prosser's skate and under the pad of Backstrom! 5-1 Pens! 12:29- Ehrhoff is hit hard by Cooke and hobbles to the locker room. 14:57- SUTTER SCORES!!!! Sutter blows past Suter and rips one over the blocker shoulder of Backstrom! What a shot by Sutter! 4-1 Pens! 18:02- Successful kill for the Pens! Fleury came up big and the PKers earned their pay check there. 19:05- No Downie to start this one. 20:00- Third period time and the Wild have a 1:58 minute power play to start! The Pens have to kill this and get to pressuring the Wild in the offensive zone! Lets Go Pens! 0:00- Second period ends and the Pens extend their lead to 3-1 over the Wild! 0:02- First power play chance for the Wild as Bortuzzo is called for interference. 1:00- Fleury has kept the Wild in check, this would be a total different game if he wasn't holding down the fort. 1:44- The Pens top line comes out with great speed and pressure. Every shift needs to learn from them. 5:52- The Wild have created some quality chances, but Fleury is holding down the fort and the Pens defense is doing a good job of blocking shots. 8:20- Haula is released from the box and the Pens power play comes to an end. They had a couple of good looks on net. 10:20- Right back onto the power play for the Pens, as Haula heads to the sin bin for boarding. 13:15- KUNITZ SCORES ON THE PP!!! Five seconds into the power play, the Pens strike! Letang drives a shot to the net from the point, Malkin redirects it, and Kunitz puts in the loose puck while falling! 3-1 Pens! 13:20- The Pens are headed onto the power play as Coyle goes to the box for tripping. 14:48- Brodin Scores. The Wild have a delayed penalty situation and pull their goalie. They overload at the front of the net. Brodin is finally able to put one in. The Pens lead is cut in half. 2-1 Pens! 15:21- Downie goes down hard in front of the Wild net, after getting an elbow to the head from Suter. No call and Downie heads to the locker room. 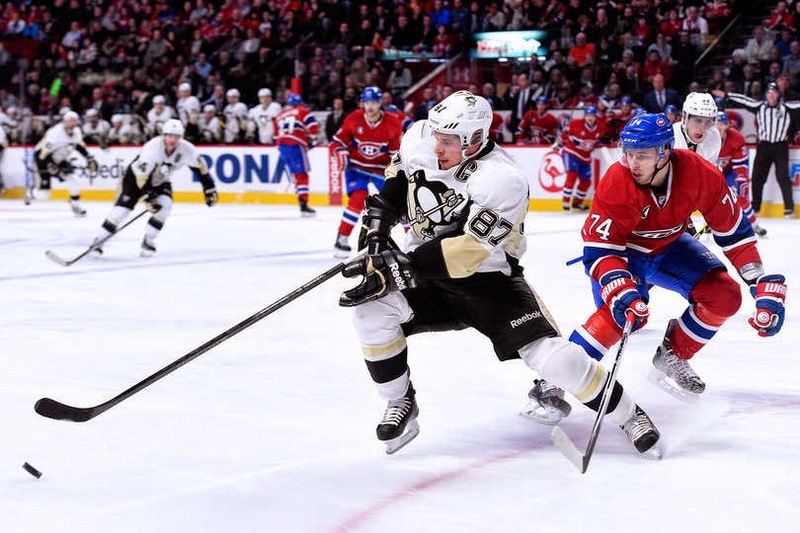 15:42- Letang gets a breakaway pass, but he is robbed by Backstrom! 17:25- Parise and Koivu get a 2 on 1 chance as they catch the Pens unorganized. Parise passes over to Koivu, Fleury comes out with the poke check and ends up making a huge save! 18:28- The Wild start the second period off with pressure and keep the Pens pinned in their own zone. 20:00- The second period is officially underway! The Pens need to pressure the Wild and not let up! Lets Go Pens! 0:00- First period ends and the Pens have the 2-0 lead over the Wild! 0:03- Crosby puts the stick handling to work as he gets a chance, but it just goes wide of the net! 0:30- The Pens have been able to hold the Wild and keep them from setting up in the offensive zone. However this hasn't been the best period for them. 2:36- Malkin's line just dominates the Wild with some great offensive zone time. It looked like the Pens were on a power play! 3:58- Suter is denied by the pad of Fleury! 6:26- Bortuzzo just eliminates Niederreiter with a huge hit on the boards. 7:46- PERRON SCORES!! Ehrhoff blasts a shot from the point, Backstrom makes the pad save! Perron puts in the rebound on his backhand! 2-0 Pens! 8:43- Fleury has been solid to start this game and has made some tough saves to keep the Wild at bay. 11:05- Crosby with two great plays right on the doorstep, but Backstrom makes the saves. 13:44- GOC SCORES! Goc puts in a rebound shot and the Pens are up 1-0! Zach Sill got an assist on that goal! 16:14- The Pens have had some good looks, but the Wild look good to start! 20:00- The puck has dropped at Consol! Things are about to get Wild! Time for the Pens to take it to the Wild! Lets Go Pens!